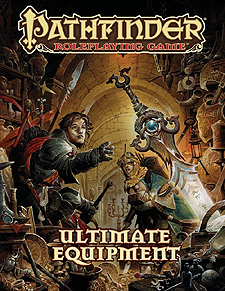 Choose your weapon and stride boldly into battle with Pathfinder RPG Ultimate Equipment. Within this handy, all-in-one reference, you'll find 400 jam-packed pages of magic items and adventuring gear, from simple camping equipment and weapons up to the most earth-shaking artifacts. Included as well are handy rules references, convenient price lists, and extensive random treasure generation tables, all organized to help you find what you need, when you need it. With this vast catalogue of tools and treasures, the days of boring dragon hoards are over, and your hero will never be caught unprepared again. Thousands of items both magical and mundane, including the best weapons, armours,magic items,and gear from the Pathfinder RPG hardcover line and select other Pathfinder sources, as well as hundreds of never-before-seen items. Tons of special materials and magical abilities to help you create exactly the magic item you've been looking for. A wealth of specific magic items, organized by type to ensure your character is always wearing as much magic as possible. An innovative new treasure generation system, designed to help GMs roll up exactly what they need, every time. New alchemical weapons, tools, and poisons. Kits to help your character get the most out of her skills or profession, plus new mounts, animal companions, and retainers. Descriptions of every item, plus hundreds of full-colour illustrations to aid in window-shopping.